Thousands of Europeans are moving from a life by the sea to a life on the sea as floating homes are spreading like water lilies from the canals of Copenhagen to Portugal’s tranquil lakes. House boats have been around for long, but floating homes with the comforts, the stability and the space of a house on land have not. Jesper Dirk Andersen is CEO of Dirkmarine, a Copenhagen and London-based firm offering houses as well as offices, restaurants and show rooms floating on a hull of concrete. “I’m a ship engineer and used to be employed in a company building tunnels. One day I was gazing out of my office window in Copenhagen and saw families crawling in and out of tiny hatches on house boats with babies and strollers and I thought to myself that it ought to be possible to live on the sea in a more practical fashion,” he told ArchiExpo. That was 15 years ago and today Dirkmarine provides the HUBB (HoUse Boat Bottom) solution, a customized and concrete hull designed to last 100 years without maintenance even in the icy, Nordic waters. The homes are generally two stories, 7 by 14 meters with a living space of 140 square meters, but Dirkmarine has delivered a 25 by 20 meters floating stage with 300 square meters both above and below deck. “We produce all our concrete hulls ourselves. We follow and check every step very thoroughly and have throughout the 15 years had a faultless record,” said Andersen. On top of being maintenance-free for a century, the concrete hull has a high stability and improves sea life; mussels and seaweed grows on the hull, which attracts fish and shrimp. Floating home owners tend to want to both live in close contact with nature and without straining the environment. So demands for low impact high yield solutions are many. From Dirkmarine one of the offerings is drawing on the one element always at hand by a floating home. A new comer to lakes and canals is Friday, a spin off from the University of Coimbra on the Mondego river north of Lisbon, Portugal. The start up is delivering its first FloatWing floating homes to clients in Zanzibar, France and China this summer. The FloatWing is built in five different sizes on a platform six meters in width and 10 to 18 meters in length. They come with a guarantee of being up to 80 percent energy self sufficient in a year depending on the latitude and size of solar panels. So while the house is built for any sheltered water between Dubai and Tromsø’s frosty fjords north of the Arctic Circle in Norway, the self sufficiency won’t be the same if clients want to keep the internal temperature at a comfort level of 20 to 25 degrees Celsius, which are FloatWing standards. “In Portugal you won’t need the generator between April and September as the solar panels creates the energy the house needs. We’ve been researching various locations for the autonomy of the house and if it sits in Tromsø then it won’t be like in Portugal or Dubai. There the electrical autonomy would be 20 percent of a year cycle,” professor Fernando Seabra Santos, Friday’s CEO, told ArchiExpo. 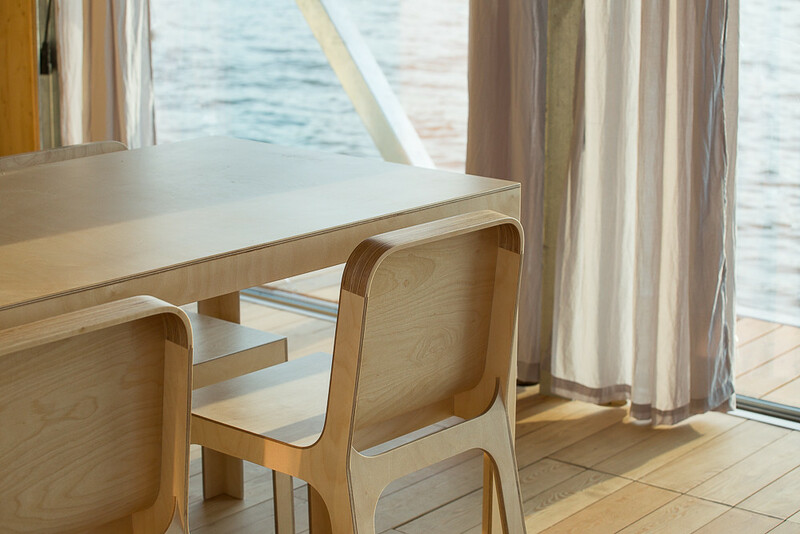 While the company’s homes are built on a fiberglass catamaran construction, the materials used in the living areas are all wood. “We use natural materials from this part of the world. The entire house is insulated with a ten centimetre sandwich of cork and we use Nordic pine wood as internal material. Not just for walls and floors, but also for kitchen, closets and toilet. Floating homes often use more artificial materials as plastic and fiberglass, but ours are natural,” said Santos. “Our first prototype was made of steel, but we chose to go with fiberglass to lower the weight of the house by three to four tons. The choice of a catamaran shape makes it very stabile. If you put 12 people on one side of the house it only tilts by one degree,” he said. All of the technical parts, the batteries and water management are kept in the floaters. So is the waste water management that offers three stages of treatment including inverse osmosis purifying the water to a degree where it’s almost drinkable. Unlike the heavier concrete hulls offered by other manufacturers, the fiberglass catamaran is mobile both on land and at sea. The company delivers the floating home and offers to transport it in two or three standard containers and reassemble anywhere. At sea it’s fitted to move by itself. “Our houses have two outboard motors offering a moderate speed of about four knots. The idea being that you may choose to sleep in a new place every night. It gives you full autonomy,” said Friday CEO Fernando Seabra Santos.